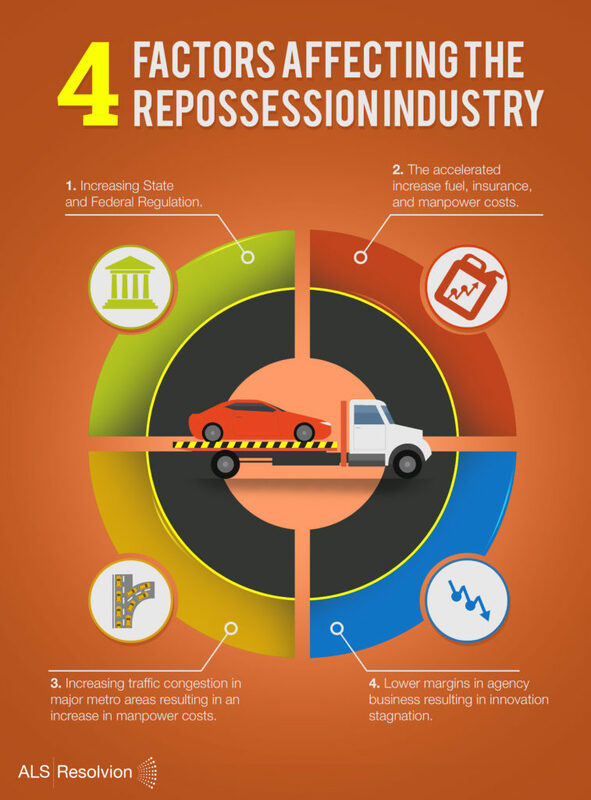 There are 4 factors that cause current and future constraints in the repossession industry that impacts auto lenders, repossession management companies, and recovery agents. Over the next decade, these factors will continue to put pressure on the industry. Increasing State and Federal Regulation: The repossession industry has undergone tremendous change over the last ten years with the introduction of stringent state and federal regulation around repossession practices. These changes have resulted in a dramatic curtailment of the flexibility and methods available to field agents to perform repossessions. They have also introduced an increase in time and effort on the part of the agency and the field agent to comply with the regulations. The accelerated increase fuel, insurance, and manpower costs: Costs at the agency level are increasing at a faster rate than in prior years as a result of insurance premiums, increased fuel costs (in part due to traffic increases), and manpower costs due to minimum wage laws and an increase in “skills needed” to comply with regulatory requirements. Increasing traffic congestion in major metro areas resulting in an increase in manpower costs: Increasing traffic in the major metro areas of the United States dramatically impacts the time it takes to execute on a repossession. From investigation of an assignment to the time it takes to deliver the vehicle to a secure lot. Traffic in the major metro areas is forecast to get dramatically worse over the next ten years. In 2018 the DOT estimated that the average person of driving age lost 42 hours stuck in traffic jams, spent $160B in fuel costs, $28B in cost of truck transport. These numbers are projected to continue to increase (DOT). Lower margins in agency business resulting in innovation stagnation: Lower margins in business means less money is spent on innovation. The state of the software available to the repossession industry is behind that of most industries. One major factor for this is that with low margins there is less likelihood for larger consolidation plays (a fractured industry). Furthermore, with low margins small businesses do not have the resources to invest in innovation. To compound this, fees the repossession industry used to include in their revenue model are being reduced and eliminated.